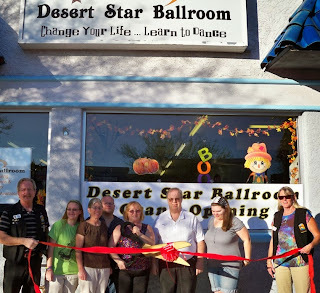 The Lake Havasu Area Chamber Ambassadors held a ribbon cutting ceremony for Desert Star Ballroom, celebrating its grand opening and new Chamber membership. Attending the ribbon cutting from left to right were Steve Bentley, Zoe Hinkle, Jill Hinkle, Allen Huff, Tammy Melpolder, Donald Melpolder, Sallie Melpolder and Audrey Hoyt. Desert Star Ballroom offers a variety of dance and fitness classes including Ballroom, Latin, Swing, Country, Rockin Body Boot Camp, Hoop Fitness, R.I.P.P.E.D., Belly Dancing and more. Desert Star Ballroom is available for parties and events as well. It is a family friendly location. For more information contact them at 928-208-0274.